" ......a handcrafted doll is one of a kind, an individual which carries the spirit of the maker in its stitches and absorbs the spirit of the child who loves it". The dolls I make are 16'' tall and made from natural materials. First off I wind a ball from washed fleece to form the head. The ball on the left of the photo has a 12'' circumference and is probably a bit large to be honest. 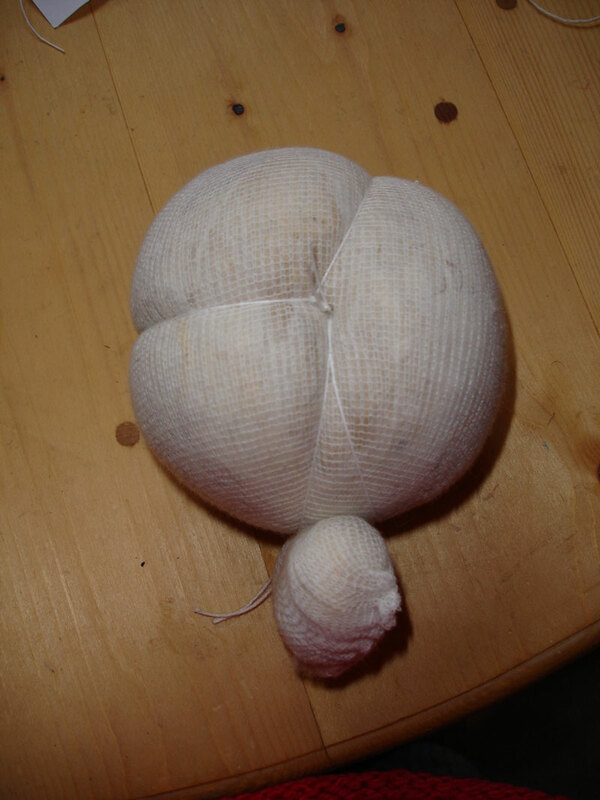 Then I take two pieces of carded fleece and place them in a cross and I put the head on top and I encase the ball and put it into a piece of tubigauze which I have stitched along the top. I push the head into the tube and tie it at the neck. There will be fleece sticking out but that's OK because it forms the shoulders/chest. Next off you need to tie the eye, head and chin lines. I take a long needle and linen thread and I go into the side of the head at the ear (halfway down the head) and I go through the head to the other ear. Bring the thread back across the face and tie very tightly to the thread hanging out at the first ear. Then take the needle over the head and back through second ear to the first ear and pull tight, then take the thread under the chin and through the second ear to first, pull tight and finely round the back of the head and same process back to the first ear. Phew - your fingers will be aching by now but tie the two threads together and cut off the tail. Then take a piece of skin coloured stockinette and stretch it and pin it across this head and sew up the back and top and again tie at the neck. 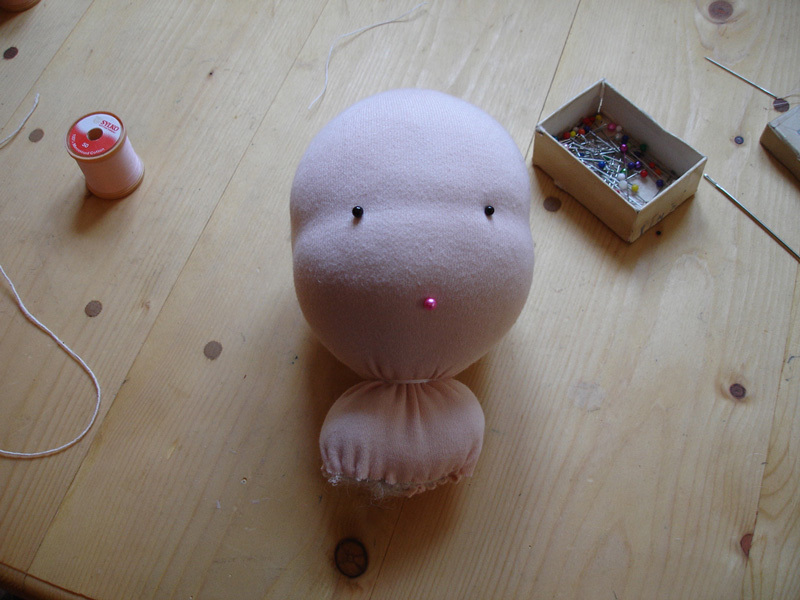 Place pins where you think the eyes and mouth should be and embroider them. Then sew up the arms and body on the sewing machine. Turn right side out and stuff the hands and arms with fleece, firmly. Sew the arms onto the back of the chest piece. I forgot to say to leave a few inches free at the top of the arms. 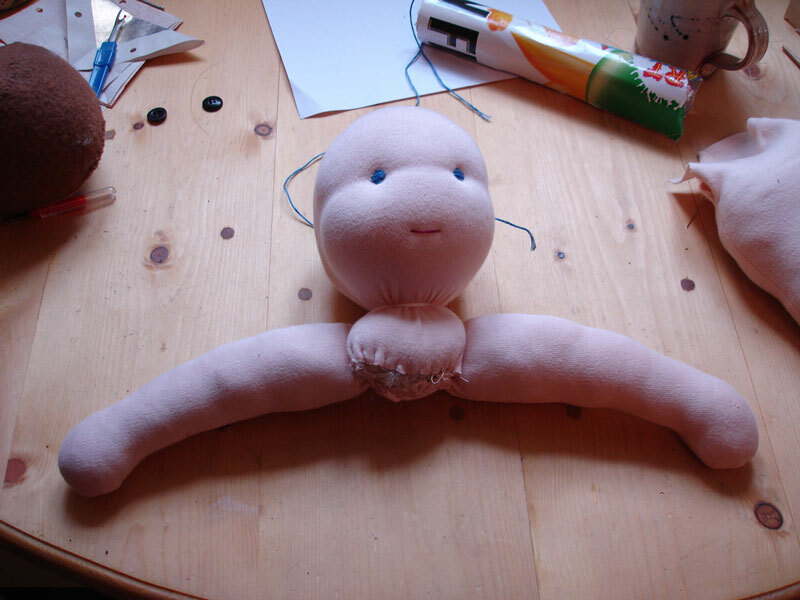 Stuff the feet and then the legs and then the tummy of the doll. Place the head and arms into the body and sew around the arms pushing in more fleece from the other side to firm up the chest. Finally sew around the neck and sew the head to the body with ladder stitch. You will need to bind off the hands and feet now but I forgot to take a picture of that. Now the time consuming process of doing the hair. For boys I crochet a cap and then hook individual strands into the cap. For girls I either make a hair piece by winding wool around a book or I weave the hair over pins placed on the middle of the head and the ear which I then sew down. I would seriously recommend that you get a book for the pattern and for hair making instructions. A very good one is 'Kinder Dolls' by Maricristin Sealey. For doll supplies like the tubigauze, stockinette and hair you could try Weir Dolls, Waldorf Toys or Myriad. Here are a few more pics of some of my dolls. Once you can make the head there are endless ways of making dolls with them. 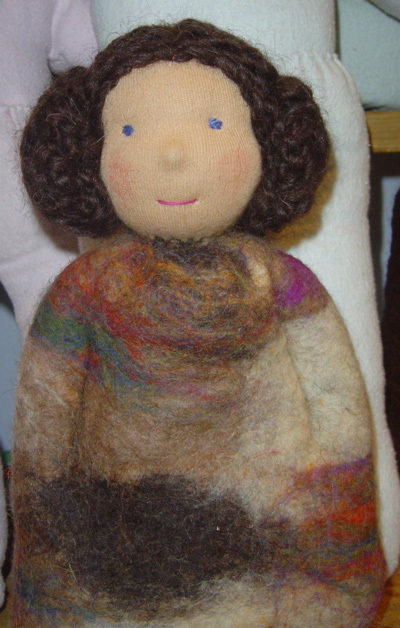 You can make a doll with a felted body or use and old cardigan. Well, I think that's enough navel gazing for one evening. Do let me know if it doesn't make sense and good luck - it isn't that difficult honestly and your child will cherish it forever. Please see below for pattern link. I WILL NOT BE SENDING THE PATTERN OUT ANYMORE! How spooky to be re-writing this post almost exactly three years later. Since that time I have been inundated with requests for the doll pattern which I naively offered to send by email (little did I know that I would send well over two hundred). Nowadays there are so many more posts and tutorials about. One blogger has put together a page of helpful links here and you can also search Flickr for inspiration - there are some very beautiful dolls there. I usually get asked about supplies and I would suggest that you look at the websites of the suppliers above. They have a comprehensive list of what you need and how much of it. As for the pattern I've finally worked out how to attach it here. So all you have to do is click on the link and print it off . Thanks for the lovely compliments you've sent me and good luck with your own doll making. I hope you have as much fun as I have had. Please use the link above to print out the pattern. I WILL NOT BE SENDING THE PATTERN OUT ANYMORE! I have been admiring your pretty dolls for some time now. Thanks for taking the time to post a tutorial. I have two young nieces... so here we go. Your tutorial is very timely! I have been looking at instructions since there a couple of people I want to make the dolls for. Your dolls are an inspiration. I think YOUR dolls are beautiful! I too have been looking at them for awhile and thinking they are just the sweetest things. Very inspiring! Hi,these little ladies are gorgeous! and doll making seems to be so easy! project for future! You have such a talent in making these dolls. Each one seems to have their own, sweet personality. I have a bag full of supplies to make a doll and I am going to dig into it and try forming that head. Thank you so much for sharing this and inspiring me. 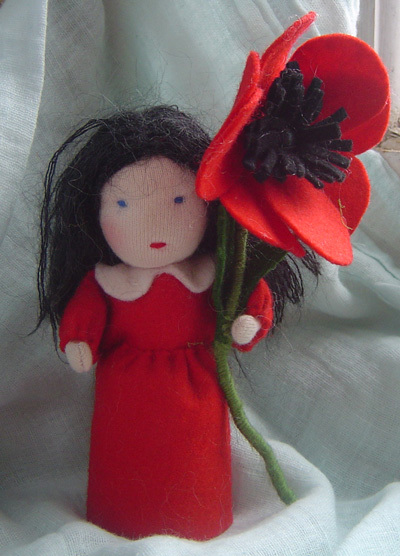 thank you so much for that description - I have always loved those dolls and wondered if I could make one - not sure I have the patience for hair though - and as I am a bit of a perfectionist I think I should leave it to teh experts! do you ever sell your dolls ??? So lovely--and I had to have boys who don't care at all for dolls! Thanks for the tips and inspiration. re the dolls (which are BEAUTIFUL! ), I always tell people that if they can't find the flesh coloured stockinette material, to dye an old white tee shirt or singlet in cold tea until you get the right shade. Much cheaper too. Your dolls are really really cute! This is the one I would wanted to make if I have a chance to make dolls! Lovely work!! Thank you so much for the instructions. I will be making both my babies dolls using this for their birthdays in December/January. I would really appreciate the pattern too if that's OK. I love the dolls, I've been making outfits for my daughters doll and would love to make her another doll to dress. Please send along that pattern you listed above.. 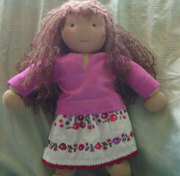 I am so glad I found your site I have the pattern but lost the instructions on how to make the doll. Can you please tell me the length of the stockinet tube, and the size of the skin tone fabric for the head for a 16"doll. Very nice instructions. I would love a pattern for a 12 inch waldorf doll, if you don't mind. Those are just adorable! I'd love a pattern for the doll if you wouldn't mind horribly. wow!!! thanks for being so generous with your ideas-most people would be stingy with them just to make a buck or two. Fantastic resource for any Waldorf parent! Thank you so much for the advice on how to make beautiful dolls for my 2 children, they will be cherished! Also great to see you've made this available for others to use, you have probably made many children very happy indeed with a doll they can keep forever!! Beautiful dolls. I have a three year old and am a beginner sewer. Your pictures make me want to try to make her a doll myself. Thank you so much for the tips and links. All the best! Such a beautiful site to stumble across. I would very much like to give these dolls a go - would you be able to send the pattern/instructions? Many thanks & wish me luck! Your dolls are so beautiful and touching . I have a two years old girl and want to make her first mother-made doll . I'd like to have the pattern if that's OK . Many thanks and best wishes ! Your dolls are soooo lovely! Thank you for these instructions. Can you please send me the pattern for the doll body. Hello, thank you for the instuction, could you send me a pattern for the body? ooooh... I've always wanted to make a Waldorf doll, and now I can't wait to make a couple for my nephews! Thank you, thank you, thank you for the photos with the instructions! Could you send me a pattern for the body as well, please? i'm so thankful to have run across your site. 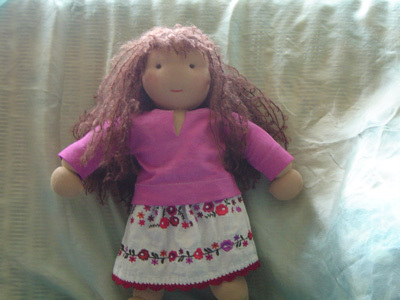 can i please have your pattern for a 16" (or so) doll? i have two girls and i'm inspired to create dolls for each of them. I would love the pattern. A friend of mine actually just asked me to make a few of these dolls for her kids for Christmas. I love your tutorial and I now feel a little more comfortable with the task at hand. Thanks so much!! Great tutorial! I would like to try making a doll for my first great grandaughter and I would like to take you up on your very generous offer of the pattern. Thank you!!! 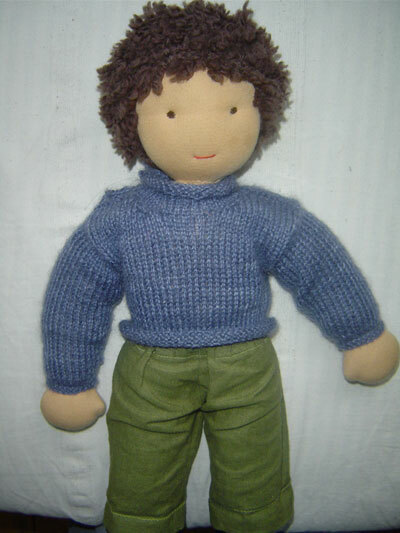 Did you use a pattern for the sweater on the boy doll (Alfie)? I have been looking for a nice looking doll sweater pattern and am having a lot of trouble finding one. Thank you! your dolls are beautiful. I've only just been introduced to Waldorf dolls. The thing I'm wondering is how long does it take to make one of them? Wonderful tutorial for the Waldorf doll. Your dolls are beautiful. I CAN'T WAIT TO GET STARTED MAKING A DOLL FOR MY THREE GIRLS (AGES 1,2, AND 4) PLEASE SEND ME THE PATTERN WHEN YOU HAVE A MOMENT. I APPRECIATE ALL OF THE WONDERFUL INFORMATION. THANK YOU. So cute! Would you please email me the body pattern? Thanks! hey, love your waldorf dolls, my daughter really wants one, could you send me the pattern please? and the materials you use too, thank you. Thank you for the wonderful photos and explanation about making a doll head. 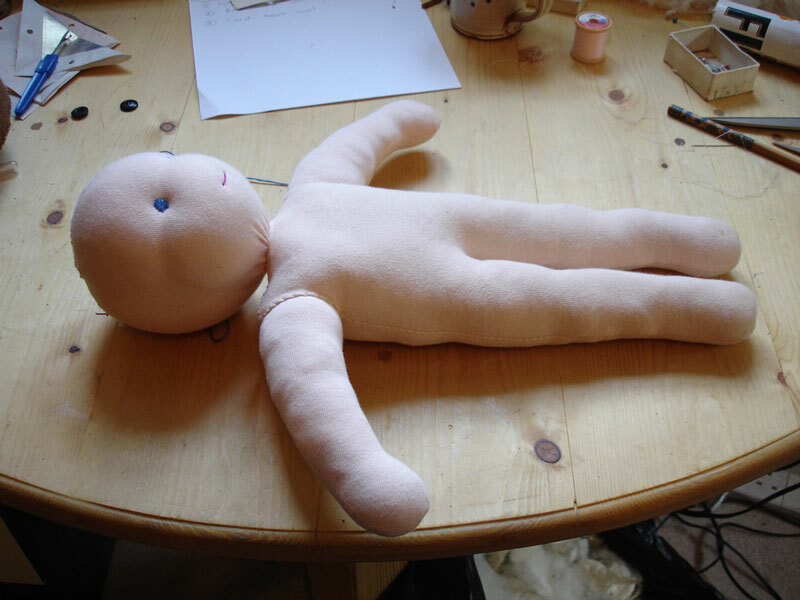 I've been so intimidated by that one aspect of dollmaking that I've never tried , despite being fairly crafty and wanting to make a Waldorf doll for years. Today I made my first doll head! Yay! Thanks! I would appreciate a copy of your pattern. Thanks for the tips. I sat down today with the intention of seeing how difficult it would be and ended up finishing the head. On to the body, some clothes and a great Christmas for my middle child. Wonderful! How nice of you to share-I bought a pattern a few years ago and have since lost it... Now a friend wants one for her daughter so if you dont mind, i would love a pattern! Also, about how much skin material do you need if you plan on making the doll with a full skin body? Thanks! wants to make a doll with herself hand. Please give me a pattern,thank you! can I have the pattern for the body? I think these are amazing! Just gooled to find instructions for waldorf doll eyes and it brought me to you again!! Can't believe I've never noticed this post before when reading you lovely blog! My head is almost ready for eyes and mouth but in the book I have it just tells you to make the eyes from 1 stitch, I've looked closelt at yours and they look bigger, can you let me know how you do yours as I think 1 stitch will make eyes too small for my head, if you know what I mean!! Oops, meant to type "googled"! Just found your site. I love the dolls. I would love to make one for my kids. If you could send the pattern I would appreciate it. Well thank you for such a wonderful tutorial. The dolls are very personable. What a wonderful post this is - I refer to it often! I have finally gotten myself past the wishing stage, and with the help of a kit, I've now made my first head (it's slow going, this). I can't tell you how often I have come back to look at the photos and the directions and gather that little bit more that makes a waldorf doll so darn appealing. Thanks again for taking the time to do this! Your dolls are beautiful ! I am writing from France, and I would like very much a pattern so I could try to make a doll for my 9 monthes old little girl. Beautiful blog and your dolls are absolutely sweet.Thank you for posting such a valuable resource. 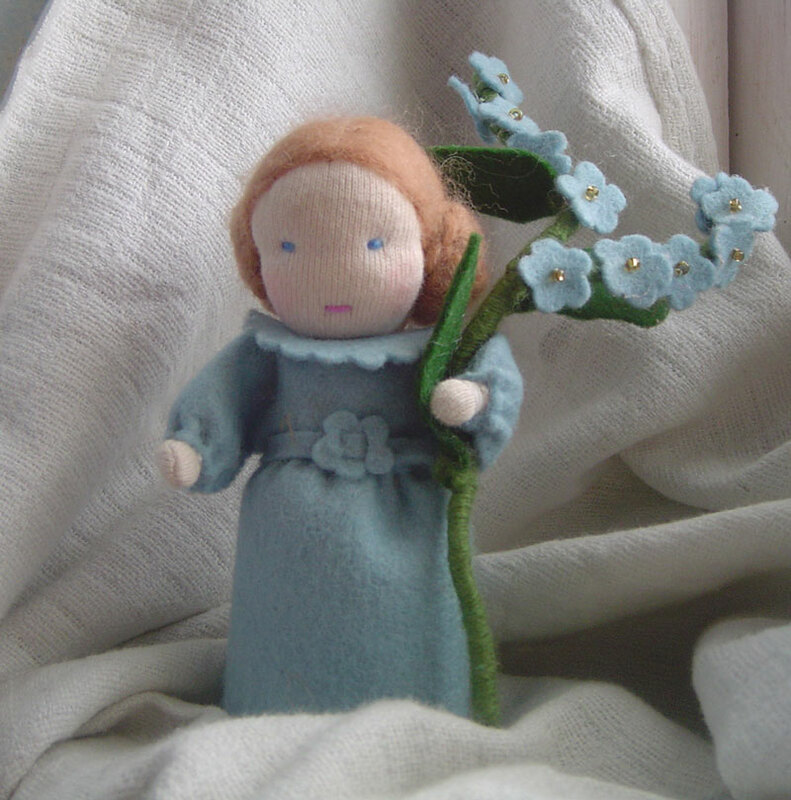 I've posted your link in my blog post about Waldorf Dolls. Blessings! thanks a lot for this informations! it's fantastic!!! I would love the pattern for these- I've no eye for dimensions lol! Thanks! lovely! and much better instructions than some, and good pictures. I would really like to take you up on the pattern offer as well, please? Thanks so very much! i actually go to a waldorf school! Hi, what great instructions!! I've been searching everywhere for a pattern & would really appreciate if you could send me one. Thank you! My daughters are going to love them! Just lovely website...thank you...a young friend has asked me to, (pretty please with sugar on top),try and make a couple of dolls for her children...so with your lovely ideas..I might be able to do that for her...could you please send me a pattern for a doll thank you so much. I love your dolls! Do you have a pattern for sale or to share? I would love to make one of these for my neice, who turns 1 year old next month. 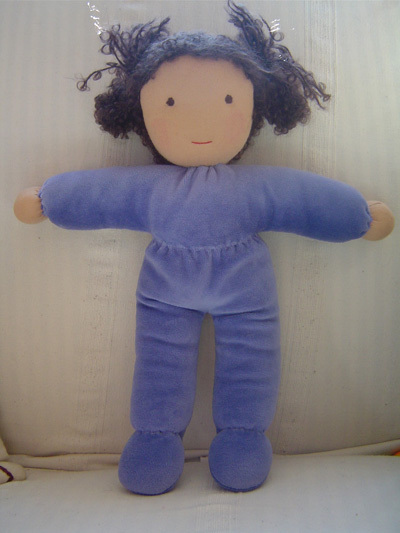 Would you be so kind to email the doll pattern to me, please? Thank you! 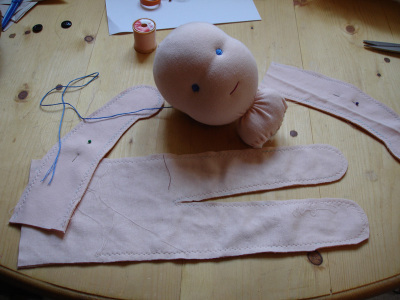 I am so excited, I am in the process of making my very first Waldorf Doll although I got a premade head this time. 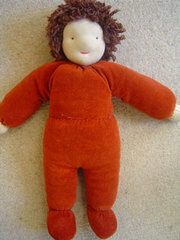 I am making the 16" "Honey Doll" for my son's birthday, and would like to make this real Waldorf Doll next time. 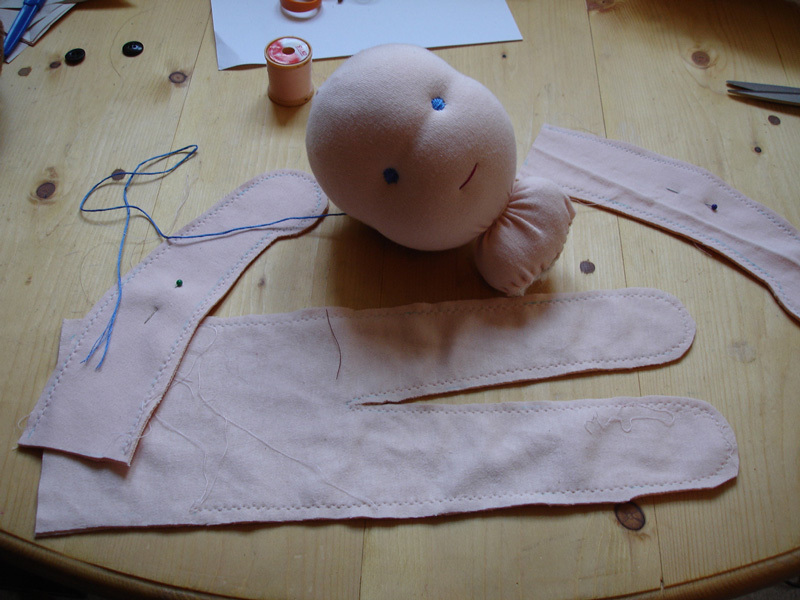 So far, I have the body made, and now I have to embroider the eyes and mouth and put the wig, and make some clothes. I am SO EXCITED! This very post inspired me last year, and I have been daydreaming about making one since then! Thank you for showing the step by step and making it look so doable! :) If you have a pattern for a crochet sweater, I would love that! Thank you thank you thank you! Thanks for your page its really inspirational - I am also making waldorf or form dolls - would love a copy of your pattern too though to add to my collection. Please could you email me the pattern for the Waldorf doll - I want to make one for my child care course. Thank you for the tutorial and offer of the pattern for the body. Could I have a copy of the pattern? Thanks in advance. this is awesome. could i get that pattern from you? also, i don't really get how to attach the body to the arms/head. and how do you attach the hair? sorry for the probably stupid questions, i've never made a doll before. :) thanks! 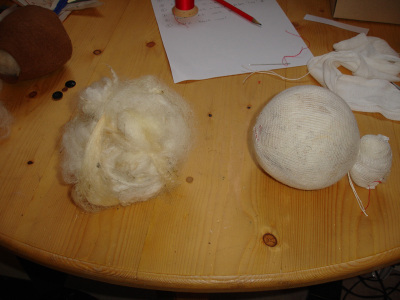 You say you use washed fleece for the stuffing; do you think carded wool would do? 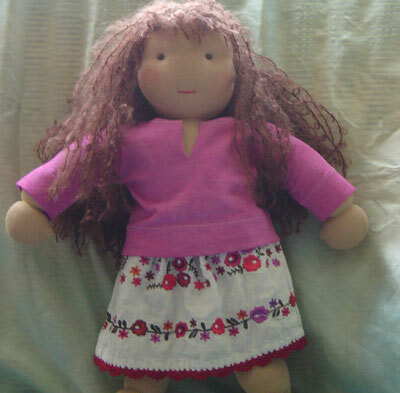 I am trying to make a Waldorf style doll for and with my 5 year old daughter and would LOVE it if you could e-mail me a pattern for the body. MANY thanks and we surely enjoyed your doll photos! Thanks! My name is Tinny, living in Taiwan and I'm a home Mum, too. May I have the pattern of the "waldorf doll"? Your dolls are beautiful! I've been looking for a doll for my little girl - a first doll for a baby (she is 8 months old). I'd love to get a pattern for one of your smaller dolls if that's possible - all the stores carry are dolls with hard faces that are not suitable for babies. Your dolls are such a great idea! I am about to undertake making my first doll. You have inspired me. Would you mind sending the body pattern you mentioned my way? Thank you! I just found this and thank you so much. If you have time I would love to know how you add the cute little nose, like on the felted doll above. Your dolls are beautiful and I would like to try my own. I have 3 daughters who might think that is cool.?? I would love to make these beautiful dolls - please would you kindly send me the pattern? Thank you for this wonderful site and easy instructions! Your dolls are so beautiful. I would love to make one each for my own little girls and was wondering if you still gave out the pattern? Just found these wonderful instructions and photos. If the pattern is still available I'd love to have it too. Thanks in advance. Your dolls are so beautiful. Would you please share your pattern with me. With your wonderful tuition I am going to attempt making one each for my two new grandaughters who have been adopted from Russia. Your blog Is very informative , I am really pleased to post my comment on this blog . It helped me with ocean of knowledge so I really belive you will do much better in the future . Good job web master . Hi, this is the first time I have read your blog and would love to get a pattern for the Waldorf Doll. I absolutely love what you have done... you have inspired me to make one of my own. You are very talented. Hi, Thanks so much for posting your lovely tutorial. Your dolls have an innocent and joyful presence. 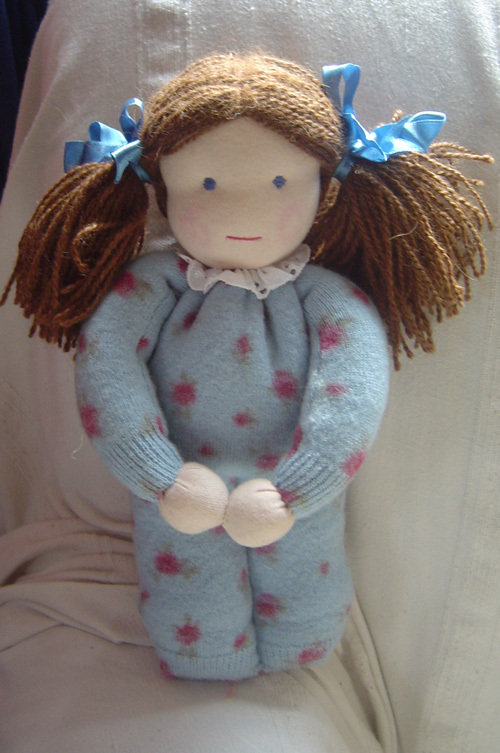 I made Waldorf inspired dolls for my older girls many years ago and it was such an enjoyable and satisfying process. Your tutorial helped so much to remind me of the steps. My older girls are now 18 and twenty three, but I would now like to make dolls for my 7 year old twins. (Somehow always too busy until now). Unfortunately I have lost my instructions and no longer have a stash of materials. I wanted to purchase on line but I do not remember how much material is needed for the 16 inch doll. I would be so grateful if you would e-mail me your pattern as I'd love to at least have dolls in process in time for Christmas. thank you so very much. Hi! I'd love the pattern! Any info on making the legs seperate? Thank you so much for posting this....I would love a copy of the body and limbs pieces as I can't get the proportions right and have made an octopus instead!! I am a mother of 4 kids, 3 girls and 1 boy, and I have been looking for doll patterns that I can make for them to fit their personalities. This is great set of instructions. Could you send me the pattern, pretty please. Hi, my name is Carol. My daughter is African and I was having a hard time finding a doll who was black (and not a Bratz!) to give her for Christmas. I've decided to make her a Waldorf one after seeing your inspiring pictures. Could you send me the pattern for the arms and legs? Thanks! Thank you so much for the advice. Nice instructions. I would love a pattern for a all size waldorf dolls, if you don't mind.